Home / Fanboy Fail Fridays! • JM / Fanboy Fail Friday! 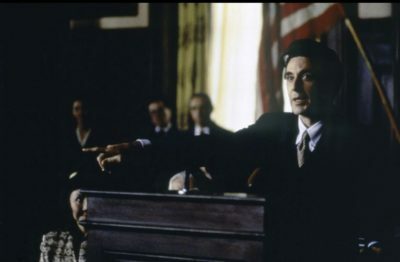 JM Rushes to “City Hall” only for Pacino To Take Another Meeting! Doh! I’m so excited that JM is back! We’ve missed him around here at MTF and while his first article back is a Fanboy Fail there’s a lot more on the way! Check out JM’s Fanboy Fail below! Meeting an icon is impossible to live up to no matter how high or low your expectations are. Trying to replicate an amazing experience for same said icon is equally exasperating. Both beautifully describe my last Al Pacino adventure. A few years ago, Pacino promoted “Wilde Salome” and “Salome” as a double feature. 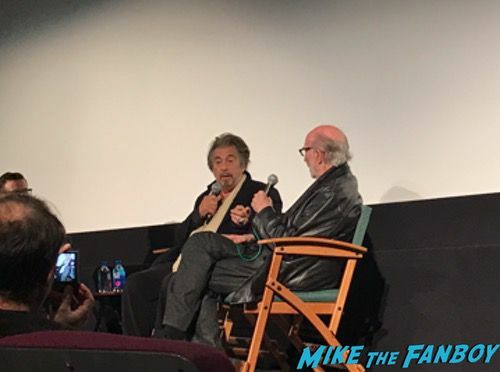 I managed to have him sign two items, including a vintage playbill featuring him and John Cazale (Fredo from “The Godfather”), which he later apologized for his bad autograph once he realized what he was signing. Considering how seamless it was last time I had hoped for a similar experience, but like Spiderman I got a “an autograph sense” something was going to go right.” After all anything can happen. 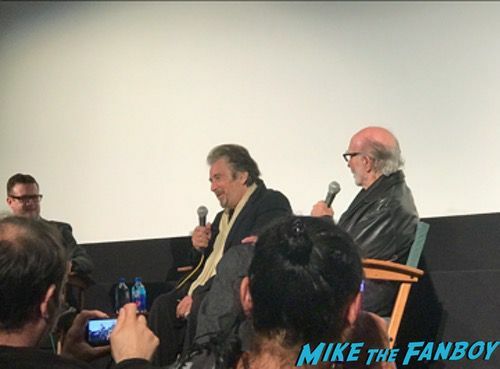 The night started off fairly smooth as Pacino was promoting his film “City Hall” along with his friend/director Harold Becker. I managed to get solid seats, but noticed some peculiar things with how the setup was designed. Little details most people would overlook and I just enjoyed the people watching with my buddy. As time progressed I noticed a Latino gentleman holding onto four seats in a great spot, but kept telling people they were taken despite the screening was about to take place (His guests did not arrive until the last 30 minutes of the movie and was fairly disruptive checking his phone frequently on WhatsApp-great if you ever need to text/make international calls). 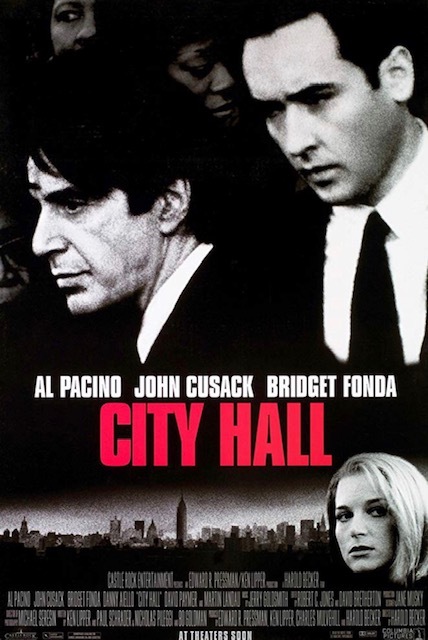 Considering the caliber cast with “City Hall,” John Cusack, Bridget Fonda, Danny Aiello, Martin Landau, Richard Schiff, and David Paymer, it was surprising neither my friend or I had heard about this film from 1996. It was a solid suspense/crime drama and very enjoyable-something that would not be made in today’s tentpole mindset. 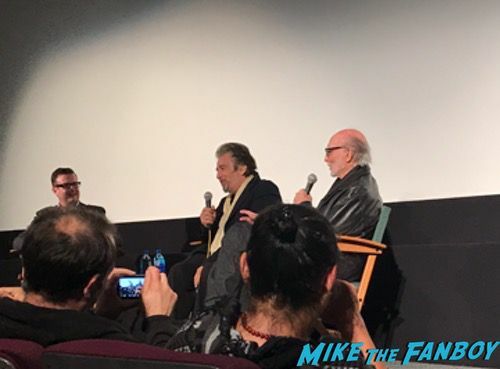 Director Harold Becker made his way to the front during the credits, but the enthusiasm and excitement seeing Pacino when he was introduced generated a standing ovation. There is something electric about Al it’s hard to say and being in the room with someone larger than life alone is impressive. As always, Al’s anecdotes exuded excitement and entertained every one of us in attendance. His story about an unemployed actor getting “One Line” is an amazing experience to witness and will leave you laughing. 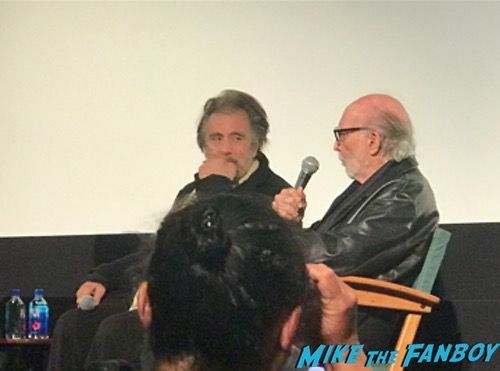 Both Becker and Pacino answered a wide variety of questions when it was turned to the audience. 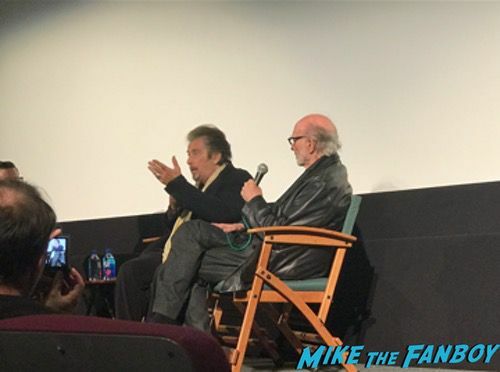 The same Latino guy I was worried about pulled out a Spanish “Scarface” steelbook and a Silver Sharpie anxiously rocking back and forth putting his arm up and down repeatedly even when Pacino was talking. I tapped my buddy and say this doesn’t look good. 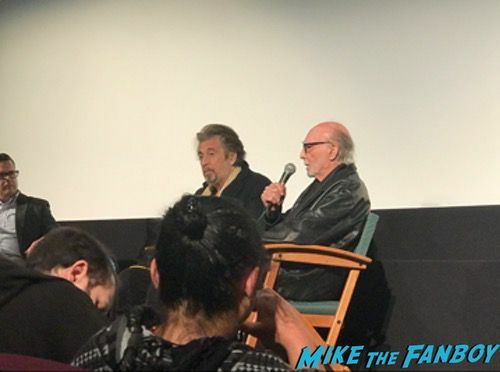 Eventually the guy was called on and had a (2) part question for Pacino and the moderator repeated his first question about filmmaking, but the guy was positioning himself as though his second question was autograph/meet & greet related. Luckily Latino Guy got caught off when he had a second question after Al answered his question and was dismissed by the moderator stating “More people want to ask questions too.” Still sharpie in hand it made me nervous considering there was still 10+ minutes left. Shortly thereafter the Q&A ended. People immediately rushed up and Pacino with security made an effort to move quickly after signing. However, the foreign guy literally pounced and managed to bring his (4) person entourage blocking the area as “they wanted to be close” and take pictures preventing others from moving closer. As a result people behind jumped up on stage and acted like idiots. Security sternly warned other fans multiple times NOT TO DO THAT and people ignored. Unfortunately Pacino got whisked away and people tried rushing outside to meet him. Pacino did not sign as there was 20+ people already outside near his car. I was bummed, but not surprised as people simply can’t control themselves and act like idiots. Fanboy Fail, but I’m glad I already met him once so I wasn’t completely devastated. Fanboy Fail Friday! Christina Aguilera Zips Off! Bill Hader Wouldn’t Even Wave! And Even Some Random Girl Who No One Knew Would Acknowledge! Doh! Fanboy Fail Friday! Asking The Question Bro, What Happened? After Getting The Slip From Corey Feldman And Jamie Kennedy! Wha? Fanboy Fail Friday! Jon Bon Jovi Ignores! Nicole Kidman Dashes By! Elisabeth Shue Is A No Show! Doh! Autograph Madness And Sadness! But Meeting Colin Egglesfield! Jeri Ryan! Alan Ritchson!